If you have ever considered making the switch to an environmentally friendly electric vehicle, don’t drag your feet. Though EV prices are falling, and states are unveiling more and more public charging stations and plug-in-ready parking spots, the federal government is doing everything it can to slam the brakes on our progress away from gas-burning internal combustion engines. President Trump, likely pressured by his allies in the fossil fuel industry, has threatened to end the federal tax credits that have already helped put hundreds of thousands of EVs on the road—a move bound to harm not only our environment but our economy, too. After all, the manufacturing and sale of EVs, hybrids, and plug-in hybrids supported 197,000 jobs in 2017, according to the most recent U.S. Energy and Employment Report. In the face of the administration’s hostility to combating climate change, the action of individual citizens grows ever more important. The U.S. is the world’s second-largest producer of greenhouse gases, and transportation accounts for the largest share of pollution of any sector of the economy. Driving an EV or hybrid gives us an opportunity to help rein that in. Cleaner cars also make good economic sense. The fuel efficiency of cars and light-duty trucks operating in electric mode is equivalent to up to 100 miles a gallon in a conventional automobile, according to the U.S. Department of Energy’s Alternative Fuel Data Center. That translates into average annual savings of close to $800 for EV drivers. Plus, EVs are just fun to drive. They’re practically silent, handle beautifully, have no tailpipes (and therefore no tailpipe emissions), and produce instant torque, making acceleration on the road fast and smooth. “It’s a great driving experience—you hear people talk about drivers with an ‘EV smile,'” said Luke Tonachel, director of NRDC’s Clean Vehicles and Fuels Project. Take advantage of incentives while they last. Consumers can currently buy and lease EVs at a considerable discount thanks to tax credits and other incentives offered by the federal government, states and localities. The widely touted IRS Plug-In Electric Vehicle Credit, for instance, saves buyers up to $7,500 on the purchase of qualifying cars. States have their own incentives, including a rebate of up to $7,000 for buying an electric SUV or pickup truck in Colorado and a credit of up to $2,500 for leasing a plug-in EV in Massachusetts, for example. Benefits like local electricity discounts, reduced tolls, free parking, unrestricted access to HOV lanes and rebates for installing home charging equipment further sweeten the deal. For a full list of incentives currently on offer, you can search by zip code here. But the emphasis is on currently. The game-changing federal tax credit for EVs first offered in 2009 is limited to the first 200,000 EVs sold by manufacturers. EV industry leader Tesla has already hit that cap, and General Motors may have just hit it as well. Ford, Nissan and Honda could reach their limits in the next two to three years. One tax quarter after this happens, the tax credit for their buyers drops to half the total, before phasing out entirely after a year. A coalition of carmakers and some members of Congress have proposed lifting the caps and extending the federal program for 10 years, but they face opposition from lawmakers with ties to the fossil fuel industry who want to cancel any subsidies for clean energy. Consider your (many) EV options. With commitments from the world’s major carmakers to eliminate internal combustion in their cars before 2025 or 2030, the design, production and delivery of EVs has shifted into high gear. More than 40 EV and plug-in hybrids from a dozen manufacturers are now on the market, and carmakers will soon roll out many more models, including lots of electric SUVs. Prices range from around $30,000 for the Ford Focus Electric and Nissan LEAF to upwards of $140,000 for Tesla’s top-end all-electric Model X and the hybrid BMW i8 coupe. Finding the EV that’s right for you can be a challenge, due to a combination of market forces and the uneven playing field created by the availability of tax credits in some states but not others. For example, residents of California, where the vast majority of EVs are sold (including a record 23,710 in August 2018, or nearly 10 percent of all cars purchased in the state that month), can find many more options than consumers almost anywhere else. But that’s expected to shift now that California’s Zero Emissions Vehicles program has been adopted in nine other states, requiring a certain percentage of automakers’ annual sales to be electric cars and trucks. Together, those states—Connecticut, Maine, Maryland, Massachusetts, Oregon, New Jersey, New York, Rhode Island and Vermont—represent about one-third of the total U.S. automobile market. For help in making a choice, be sure to take advantage of dozens of websites and social media forums where EV drivers exchange the latest information about new models, test drives, car reviews and tools to help find new and used EVs for sale near you. Don’t be afraid to buy used. If you’re feeling outpriced by the options available at a dealership near you, consider buying a used EV. In general, Edmunds, the automotive industry research group, finds that they depreciate in value more quickly than internal combustion cars, which is bad news for potential sellers but creates bargains for would-be buyers. Though savings vary by make and model, the average used EV costs 43 to 72 percent less than a new one, according to Edmunds. Two- or three-year-old EVs have fewer moving parts than used conventional cars, so they show less wear and tear and will require less maintenance. (And, as with all EVs, they require no oil changes.) Like all battery-operated devices, they do experience battery-life degradation over time. But it is common for automakers to warranty batteries for at least eight years or 100,000 miles—and they are required to provide warranties covering 10 years/150,000 miles in the states with Zero Emissions Vehicles programs. Today’s EVs offer a median per-charge range of 154 miles, which goes a long way toward easing drivers’ worries about running out of juice in the middle of nowhere. Given that the average American driver uses his or her vehicle 29.2 miles a day, you can get through much of the week before you’ll need to recharge—which most EV owners do while they sleep at night, either through an outlet in their own garage or via a communal port at a co-op or condo complex. Finding the nearest charging station when you’re on the go just got a lot easier, too: Along with excellent online resources like ChargeHub and Plugshare, Google Maps has added a locator feature for smartphones, which includes information about the business where the station is found, charging speeds and port types. Overall, 2018 was the biggest year yet for state-authorized utility investments in transportation electrification, with more than 25 states across the country committing to support various EV infrastructure programs. 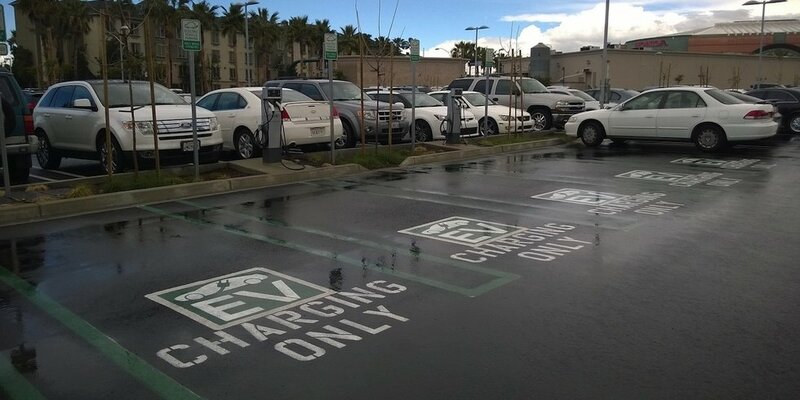 A major initiative is underway to create an EV-friendly corridor with fast-charging posts on highways in eight western states, and another one in the planning stage would link Montreal and Washington, DC. You’ll also soon be pleasantly surprised at the number of options you have for charging away from home. Two billion dollars from Volkswagen’s diesel testing scandal settlement has been earmarked for building out EV infrastructure around the country, and cities from Atlanta to Boston have passed ordinances requiring EV-ready parking places. Take advantage of low-cost charging perks. Low-cost time-of-use plans from local utilities keep the cost of charging down to the equivalent of about $1 a gallon of gas for conventional cars, according to the U.S. Department of Energy, and the cost isn’t subject to the volatility in the oil market that makes prices at the gas pump unpredictable. If you charge primarily at night, you may be able to access off-peak rates, or your costs may even be zeroed out completely. For example, some utilities offer incentives to plug in an onboard diagnostics device that transmits charging data, and then pay drivers a flat fee when they don’t charge during peak hours. And lest you worry about sacrificing convenience, drivers can simply program their EVs to draw power automatically at a certain time of night to avoid having to run out to plug in. So greening your personal transportation by going electric isn’t just good for your wallet, the economy, and the planet—it also won’t cause you to lose any sleep. Electric vehicle sales took off in 2018, with a record two million units sold around the world, according to a new Deloitte analysis. What’s more, the accounting firm predicts that another 21 million electric cars will be on the road globally over the next decade due to growing market demand for clean transportation, government subsidies, as well as bans on fossil fuel cars. All-electric cars (versus plug-in hybrids, for instance) will account for 70 percent of total electric vehicle market by 2030, the analysis says. Cheaper prices is another factor that could boost consumer demand. Cost is often cited as a major barrier to mass adoption, but the report says that ownership cost of battery electric vehicles will match gasoline and diesel cars in the United Kingdom by 2021 and globally by 2022. That’s Deloitte’s most hopeful prediction. Under less ideal conditions, it could take until 2024 for the cost to own a battery electric vehicle to be on par with traditional internal combustion engine cars, the company notes. Other reports have also suggested that electric car sales will accelerate rapidly, which is positive news for the environment and public health. These cars help reduce tailpipe emissions that contributes to harmful air pollution and climate change. However, Deloitte forecasts a global glut of 14 million vehicles as manufacturers’ investment in capacity outpaces consumer demand by 2030. “This gearing up of EV production is driving a wide ‘expectation gap’ and manufacturers, both incumbent and new entrants alike, will need to adapt towards this new competitive landscape,” Michael Woodward, UK automotive partner at Deloitte, said in a press release. Many of the world’s biggest automakers are shifting away from traditional internal combustion engines to charging. On Tuesday, Toyota announced new efforts to move its electric lineup by pairing up with Panasonic, the world’s largest manufacturer of lithium-ion battery cells. Panasonic also supplies batteries for Tesla‘s electric cars.